Hello, Your heart garland is just awesome! I copied the pattern off and I hope to make one. Thanks so much! I don't usually like valentine's day stuff, but that is so cute! Your heart garland is adorable! I am going to try to make some. Thanks for sharing the pattern! Thanks for the pattern! I did a single heart, tied it off with a bow to make it a bookmark for my daughter who is learning to read. She LOVES it! 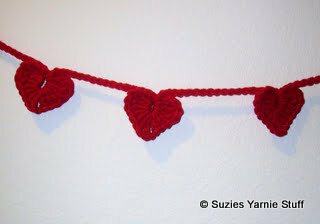 Hi Suzie I wanted to let you know what I do with your wonderful heart garland pattern. I make them for my friends when they have a rough time. It is made with thread to make a small token they can take anywhere when they need love. I have actually had requests for them from others to pass along or keep themselves. I never sell them, these are to be given from the heart. Thank you for giving me a chance to make lots of women happy to get something hand made and from the heart. Your patterns are fabulous! I come back here often to look at what else I can make. I wish you and yours good health and that God never stops your magic fingers. Can someone tell me what the abbreviation "tc" in the heart garland pattern means? Adorable! Thanks for the pattern. Hi, I have never seen so many adorable patterns on one site. Thanks so much for sharing and letting us copy them. Off to the store for more paper. Please keep the patterns coming. May I have your permission to make and place this garland in our hospital gift shop to give free to the patients by friends or relatives? This would be perfect to let them know that someone is thinking of them even after they go home. Bless your heart and God Bless.